I’m not sure who to turn to for recourse after being stalked, sanctioned, and harassed by a group of skeptic “trolls” on Wikipedia. WikiMedia Foundation is a dead end. I went to another Wikipedia forum to seek advice, and the narrative skeptics created about me on Wikipedia already spread to the forum. No one took me seriously. Why? 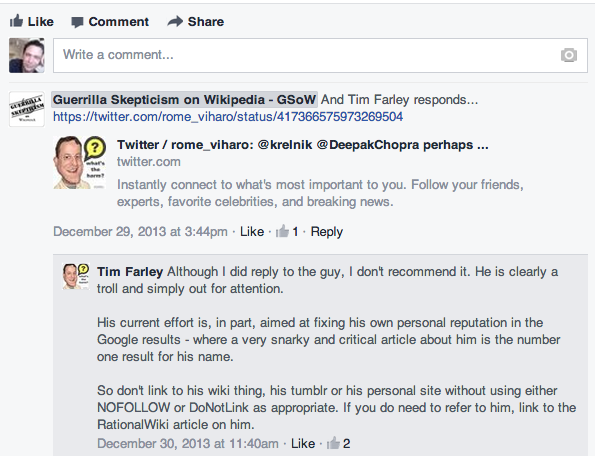 Because I was just a “troll”, as Wikipedia editor Manul invented a case on Wikipedia to get me sanctioned. Then, these Wikipedia editors created an article on me, an attack piece, as if I am some internet crank on their hit list. I reached out to a few skeptics in the community, to see if we could clear this up. Facebook. Boy was that a mistake. I found Susan Gerbic was already posting about me (the troublemaker) and this website. Interesting, she doesn’t think I’m a conspiracy theorist. Perhaps she should inform RationalWiki? Susan Gerbic appears to think I have enough credibility to clear them of involvement on the Sheldrake biography article on Wikipedia. I’m glad my credibility is good enough for GSoW to at least clear them of the charge, which I simply take them at their word for. Interesting however to see response from Tim Farley on Facebook though – according to him, my credibility is good enough to clear GSoW, but about anything else regarding what happened. No. Tim doesn’t want any skeptic talking with me. Another “suppression” tactic. Discredit me before I open my mouth. How did Tim know so much about me relating to this issue? Tim Farley is apart of this? It’s one form of bizarre hell what skeptic editors do on Wikipedia. It is another hell altogether for them to take this drama to Facebook and RationalWiki, using my real name. Tim Farley is a relative influencer in the skeptic community. I reached out to him after I was harassed on Wikipedia only because his blog covered the article. Not because I thought he was directly involved. Now that’s changed. His website skeptools is a passionate and focused site that offers skeptics online ‘wiz’ tools to further deliver the activist message. Makes me wonder what other kind of dirty tricks Tim Farley likes to use. My position is you wanted to make me a spotlight, and you got it. Now I am going to show how a small handful of skeptical activists online use harassment and bullying with that page on RationalWiki as evidence. And now I have a name to put with it, Tim Farley.